July 9, 2015 – As NASA’s New Horizons speeds towards the edge of our solar system for a July 14 flyby of Pluto, it won’t be making observations alone; NASA’s fleet of observatories will be busy gathering data before and after to help piece together what we know about Pluto, and what features New Horizons data might help explain. Right around New Horizons’ closest approach to Pluto, Cassini will take an image of the dwarf planet from its station in orbit around Saturn. Although Cassini is the closest spacecraft to New Horizons’ distant location, the image of Pluto will be but a faint dot on a field of stars. Even so, the image will provide a scientific measurement of Pluto from a different vantage point that will complement data collected by New Horizons. “The Cassini team has been pleased to provide occasional imaging support for New Horizons for several years to aid with the Pluto-bound spacecraft’s navigation. It’s great to provide one last look at it soars through the Pluto system,” said Earl Maize, Cassini project manager at NASA’s Jet Propulsion Laboratory in Pasadena, California. 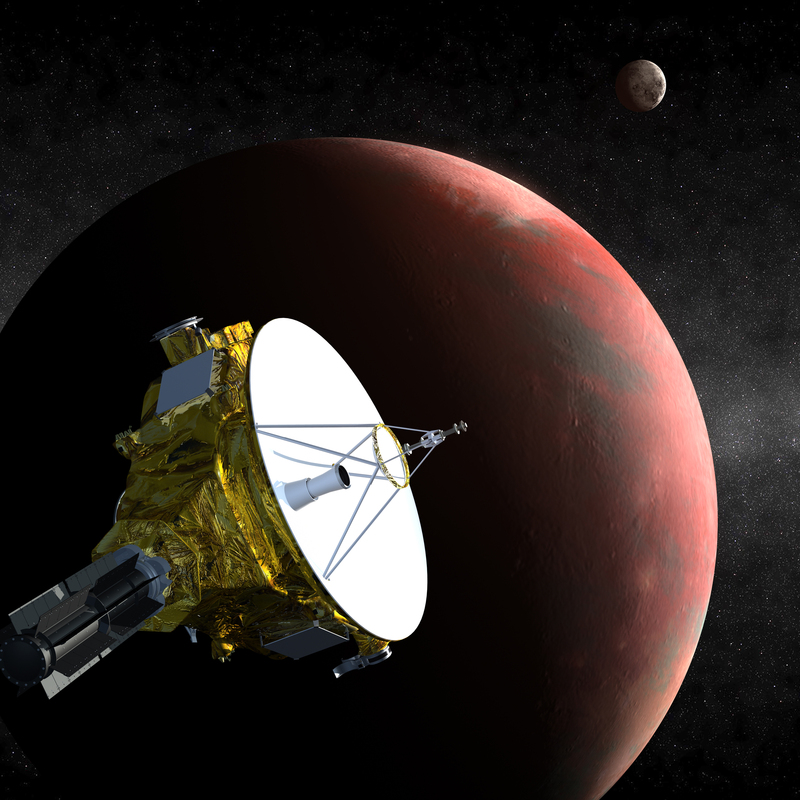 Even after New Horizons flies past Pluto, the observations don’t end there. On July 23, Spitzer Space Telescope will begin a seven-day series of observations, gathering infrared data at 18 different longitudes. The data will reveal possible changes in ice on Pluto’s surface. Beginning in October, the Kepler spacecraft in its new mission, K2, will train its unceasing gaze on Pluto for nearly three months. Similar to how Kepler detected distant planets by measuring the change in brightness of their host star, K2 will record the change in the reflected light off Pluto and its nearest and largest moon Charon. Scientists will learn more about the effects on the atmosphere and surface of Pluto imparted by the dwarf planet’s eccentric and expanding orbit about the sun. The data may also reveal seasonal changes on this chilly world. Prior to the New Horizons flyby, the SOFIA airborne observatory, an infrared telescope installed on a 747 aircraft, soared into the perfect position over the Southern Ocean on June 28, to be directly in line with Pluto and a distant star. As the dwarf planet and its atmosphere were backlit by the star, this “occultation” caused a faint shadow of Pluto to move across the surface of Earth at more than 53,000 mph, creating a ripe opportunity for SOFIA’s mobile instruments to perform scientific analysis to help scientists understand the density and structure of Pluto’s atmosphere. Since its launch in 1990, the Hubble Space Telescope has provided the clearest Earth-orbiting telescopic views of Pluto and Charon, mapped the dwarf planet’s surface, and discovered four new moons. While monitoring Pluto in preparation for the New Horizons’ flyby, the telescope discovered the tiny moons Nix and Hydra. Kerberos and Styx were uncovered in 2011 and 2012 respectively. After analyzing several years of Hubble observations, astronomers reported this year that that the moons Nix and Hydra are tumbling chaotically along their orbits due partly to a dynamically shifting gravitational field caused by the system’s two central bodies, Pluto and Charon. The moons are also football shaped, which contributes to the chaotic rotation. Hubble continues to monitor Pluto in support of the New Horizons flyby. With the combined observations of the many missions, scientists will have a rich set of data to work with to better shed light on the shadowy dwarf planet. The data will be available to the public once it is processed.